The U.S. stock market continues to be led down by former favorites like the stocks that were members of FANG or FAAMG. The reason is quite straightforward – it looks like the rate of growth for many of these companies is slowing. Prime among these companies is Apple (Nasdaq: AAPL), which is in the process of losing its crown as the world’s most valuable company to long-time rival Microsoft. 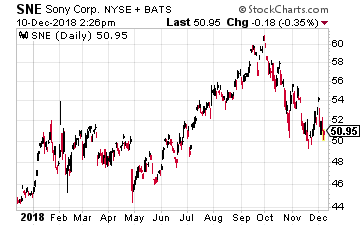 Its stock price went into reverse when it announced that it would no longer report quarterly what its iPhone sales are. That was a definitely warning sign that sales are, at the least, decelerating if not actually in decline. And now finally, Wall Street is catching up. The analysts are realizing that while iPhone sales in the U.S. are fine, sales outside the U.S. (especially in emerging markets) are not so healthy. The Apple price cut club welcomed a new member on Friday after Morgan Stanley blamed the Chinese smartphone market for weakening the outlook for iPhone sales. Morgan Stanley now expects Apple to deliver 200 million iPhones, down 13 million from its prior estimate. That would reflect an 8% decline from fiscal 2018. The cut from Morgan Stanley follows similar estimate slashes by UBS, Goldman Sachs and others. 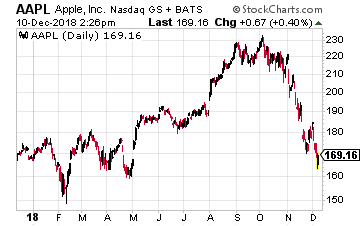 This slowdown in iPhone sales is a reason I would look away from Apple and to another company involved in the smartphone space for stock price appreciation. More on that later, first let me take a look at how Apple is playing a risky game. Why are iPhone sales beginning to slump? I believe it’s due to a lack of innovation. I’m sure you have probably have heard about 5G. It is the fifth generation of cellular mobile communications. It promises much faster download and upload speeds, wider coverage and more stable connections. It will be an absolute necessity for Internet of Things devices and autonomous cars. And it will be a reality in some select locations in 2019. Yet, Apple has said it will not have a iPhone that can connect to 5G networks until 2020 at the earliest! This decision to sit on the sidelines may be related to the company’s feud with Qualcomm, the leader in 5G-enabled chips, and its alliance instead with Intel, which won’t have chips available in time to support 2019 phones. Apple delayed having a compatible phone when 3G and 4G were first rolled out. But this time the risk is much larger. With a much bigger speed upgrade, 5G could open the floodgates to new types of mobile computing. Apple is risking jumping into that revolution too late. Its rivals may have already won the loyalty of consumers by the time Apple jumps in. These rivals include the likes of Samsung, as well as Huawei and Oppo in China. Samsung especially will likely have the full backing of wireless carriers like Verizon and AT&T, which will be prioritizing the marketing of 5G phones. Leaving the playing open to rivals by delaying the rollout of a 5G phone may end up being huge for Apple when you consider that iPhone sales account for 60% of its revenue and is the foundation of the company’s push for sales in consumer services including music and video. Despite it being in the crosshairs of the U.S. government, China’s Huawei continues to innovate. It will soon be unveiling a smartphone with a camera capable of taking 3D pictures! Besides generating pictures that can be viewed from numerous angles, Huawei’s new camera can create 3-D models of people and objects that can be used by augmented-reality apps. The new camera will also let developers control apps and games in new ways, such as hand gestures. Huawei will include this technology into several of its phone models, with some to debut in 2019. It expects to take substantial market share from Apple in China and elsewhere by offering users the ability to generate 3D models of themselves and the environment in real-time and share it with others. But here’s what really got my attention with regard to this phone — these smartphones will use sensors developed by Japan’s Sony (NYSE: SNE) that can accurately measure distances by bouncing light off surfaces. Here is something most U.S. investors do not know about Sony – it is the world leader in image sensors used in regular cameras. If 3-D cameras become popular, it could generate billions of dollars in additional revenue from the sale of its new components. The company accelerated the development of this 3D technology after buying the Belgian company Softkinetic in 2015. Sony combined the Belgian startup’s time-of-flight technology with its own semiconductor manufacturing prowess to create 3-D chips small enough to fit inside smartphones. While Apple’s FaceID facial-recognition feature is also powered by 3-D sensors, it relies on a different technology called Structured Light, which can measure depth at shorter distances. Sony’s time-of-flight sensors can do so at much longer distances. Sony’s prowess in this area was evidenced last year when it showed off its own Xperia phone that lets users take 3D pictures and models. Of course, Sony is a lot more than just a sensor company – it is a tech and entertainment conglomerate. The company is targeting record profits for the second consecutive year as its PlayStation games business heads for its best year ever. For the fiscal second quarter through September, its PlayStation business reported a 65% year-on-year increase in operating profit on strong growth in its PlayStation Plus subscription-based service. Buoyed by its recent stellar results, the Japanese technology and electronics company said it would spend $5.3 billion on image sensors over the next three years in a bid to capture the new market for autonomous vehicles. For the year ending in March 2019, Sony said it expects an operating profit of 870 billion yen ($7.7 billion), up 30% from its previous forecast set in July and exceeding a record set in the last fiscal year. These numbers will only get better if its sensors business expands as I expect. That’s makes Sony a much better buy than Apple at the moment, being at the forefront of innovation that Apple seems to have neglected.